As a Life Coach and Business Coach, I will often use stories in my work. The Cherokee tale of the 2 wolves inside us is a favourite one of mine and you may well be familiar with it. However, the ending you may be used to isn’t the original one. I discovered the original ending a few years ago and find it so much more effective. It allows clients to connect on a deeper level and to relate it to many more aspects of their day to day lives. “If you feed them right, they both win. You see if I only choose to feed the white wolf, the black one will be hiding around every corner waiting for me to be distracted or weak and jump to get the attention he craves. He will always be angry and always fighting with the white wolf, but if I acknowledge him, he is happy and the white wolf is happy and we all win. Tenacity, courage, fearlessness, strong will and great strategic thinking that I have need of at times and that the white wolf lacks. But the white wolf has compassion, caring, strength and the ability to recognise what’s in the best interests of all. 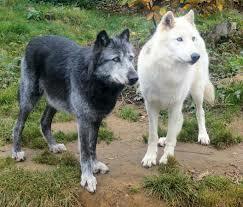 You see grandson, the white wolf needs the black wolf at his side. To feed only one would starve the other and they will soon become uncontrollable. To feed and care for both means they will serve you well and do nothing that is not part of something greater, something good, something of life. Feed them both and there will be no more internal struggle for your attention and when there is no battle inside, you can listen to the voices of deeper knowing that will guide you in choosing what’s right in every circumstance. Peace, my grandson, is the Cherokee mission in life. A man or woman who has peace inside has everything. How you choose to interact with the opposing stories within you will determine your life. Starve one or the other or guide them both. My invitation to you is to notice how you are feeding the wolves inside you. Are you feeding one or both? If only one, which one? Sometimes we engage in a battle with our thoughts; I wonder what could happen if, instead of fighting the thoughts that aren’t comfortable, you showed them compassion? I would love to hear what you think of this version and how you use it.